Why do we stop eating food when we are full ? Why do we feel sick or get vomiting sensation on the morning of an important exam ? Stressed or Anxious, one feel butterflies in stomach. Feeling nervous or going through nerve wrenching moment, stomach growls and rumbles. Well – thoughts happen in brain, but stomach acts. The gastrointestinal tract is sensitive to emotion. Anger, anxiety, sadness, elation — all of these feelings can trigger symptoms in the gut. It’s just not the troubled brain can send signals to the gut, but gut too sends signal back to brain. Scientists were shocked to learn that about 90 percent of the fibers in the primary visceral nerve, the vagus, carry information from the gut to the brain and not the other way around. Vagus nerve, originates with the dorsal motor nucleus in the medulla and extends through the abdomen to the viscera. Our Gut has its own branch of the nervous system called the enteric nervous system that can function on its own, even if it is disconnected from the brain. The enteric nervous system, the second brain consists of sheaths of neurons embedded in the walls of the long tube of our gut. The second brain contains some 100 million neurons, more than in either the spinal cord or the peripheral nervous system. It actually arises from the same tissues as our central nervous system (CNS) during fetal development. The ENS supervises the processes of digestion and stays in close contact with, and is heavily influenced by, the central nervous system (the CNS) which comprises the brain and spinal cord. The ENS and CNS also use many of the same chemical messengers or neurotransmitters including acetylcholine and serotonin. 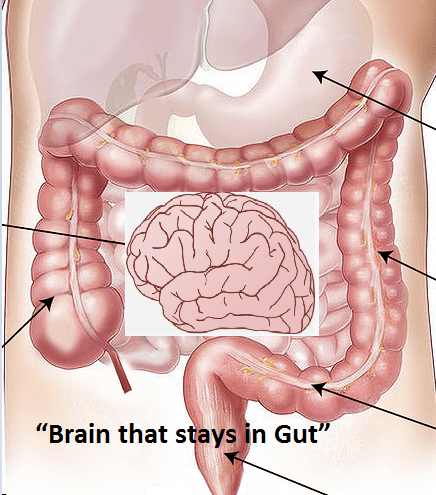 “Brain that stays in Gut” is giving a new dimension to our understanding of digestion, mood, health and disease onset. 95 percent of the body’s serotonin is found in the bowels. Serotonin is a neurotransmitter responsible for regulating things in the body like mood, appetite, and sleep. The right amount of serotonin in the brain ensures relaxed and positive feeling. Drugs that alter serotonin levels have important clinical uses such as in the treatment of depression, nausea and migraine. Gut health has been linked to neurological and neuropsychiatric disorders. Disturbances in gut health have been implicated in multiple sclerosis, autistic spectrum disorders, and Parkinson’s disease. Even age-related gut changes have a say in Alzheimer’s disease. Cell damage in the gut signals the beginning of Parkinsons disease, and cell death in the brain come only at late stage of disease. Constipation, defined as fewer than three bowel movements per week, is perhaps the most widely recognized gastrointestinal symptom of Parkinson’s disease. Studies have shown that this symptom often begins before motor symptoms are diagnosed. In one study, researchers found that having a bowel movement less often than once a day indicated a risk of developing Parkinson’s four times higher than average. There is now research that is dubbing depression as an inflammatory disorder mediated by poor gut health. Could a psychologist help me with my bowel problem? Stress-reduction and depression therapy is now used to prevent and treat gastrointestinal disorders. So don’t be surprised if depression drug is suggested when you complain of Inflammatory Bowel Disorder. Low-dose tricyclic antidepressant therapy has been found to be effective in treating moderately severe functional symptoms in patients with inflammatory bowel disease (IBD). What types of psychological treatments are available to patients with bowel disorders? Psychotherapies may help ease persistent gastrointestinal distress or at least help people learn to cope with such symptoms. These treatments include Relaxation therapy, Cognitive behavioral therapy, Gut-directed relaxation training. Biofeedback is another painless process recommended for patients with Inflammatory Bowel Disorder. In biofeedback, the physiological responses of the body, which are usually not noticed by the patient, are sensed with the electrical sensors and computer. Soon patients learn to influence the responses and manipulate physiological events and eventually their gastrointestinal symptoms reduces. There is growing awareness within the scientific and medical communities on strong connection between the status of the intestinal environment and the function of the central nervous system. The best part about developing an understanding on gut-brain connection is that we could alter our daily lifestyle choices to improve mood disorder conditions, depression and brain ailments. Very informative! I love your blog…All the best! I definitely notice a difference when I eat healthy versus when I eat junk food. I feel so much better when I watch what I eat! So true, the more I learn about the gut and how it’s connected to everything else, the more I’m striving to keep my gut (and that of my family) healthy! It’s so important to our immune system and overall well being! I had no idea, the two are so related. Thanks for sharing..
this is one of my favorite areas of health research that’s taking place…it’s a whole new way to work with the entire being, great post! Ohh is it? I never knew about this. Your posts are very helpful for all kind of people. So useful post for readers. Really I don’t know about all this stuff.